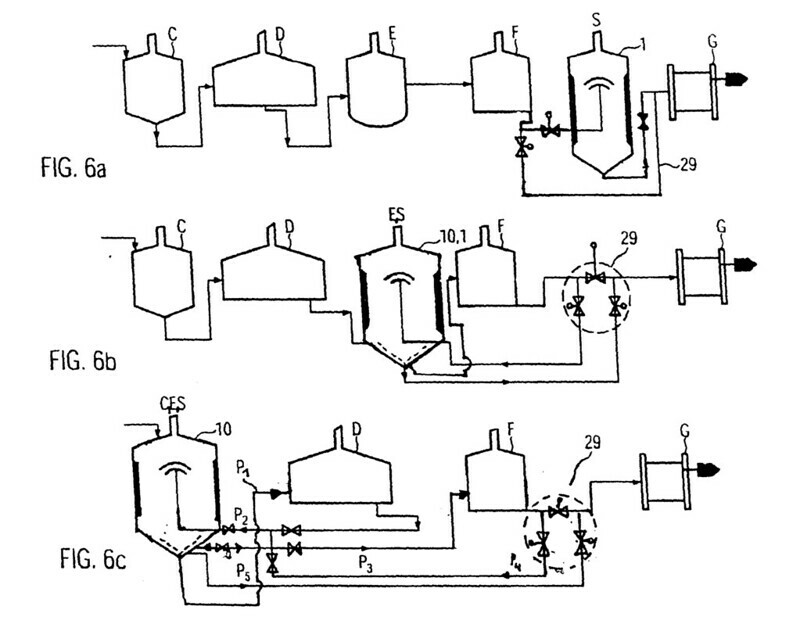 A method for producing a wort containing a reduced level of fermentable sugars is described. The method consists of providing a warm aqueous suspension of ground malt, and adding the warm suspension to a boiling aqueous suspension of cereal adjuncts while avoiding temperatures between about 52° and 72° C. The resulting wort is useful for producing a beer with a lower-than-normal alcohol content, or a malt beverage lacking sweetness usually associated with malt beverages. 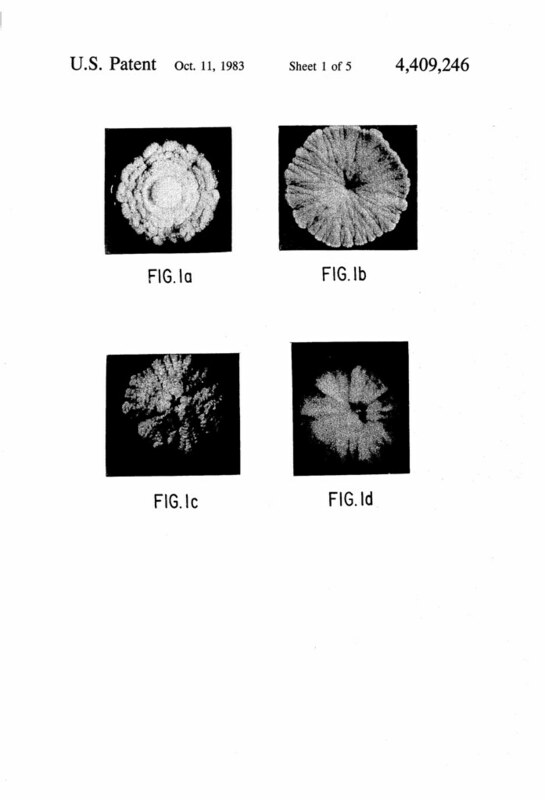 The specification discloses a novel brewers’ yeast strain and a method of manufacturing the same. The yeast is a strain of Saccharomyces cerevisiae and has been deposited at the National Collection of Yeast Cultures, Norwich, England under the number 962. Morphologically the giant colony of the novel strain can be described as a circular colony having a slightly serrated periphery, a convex surface topography with a central, globular dome and exhibiting primary concentric convolutions and secondary radial convolutions which, in combination, impart a rough appearance to the surface. The novel ale strain has the advantages that it is effective in worts having high plato values and is a bottom-cropping strain. 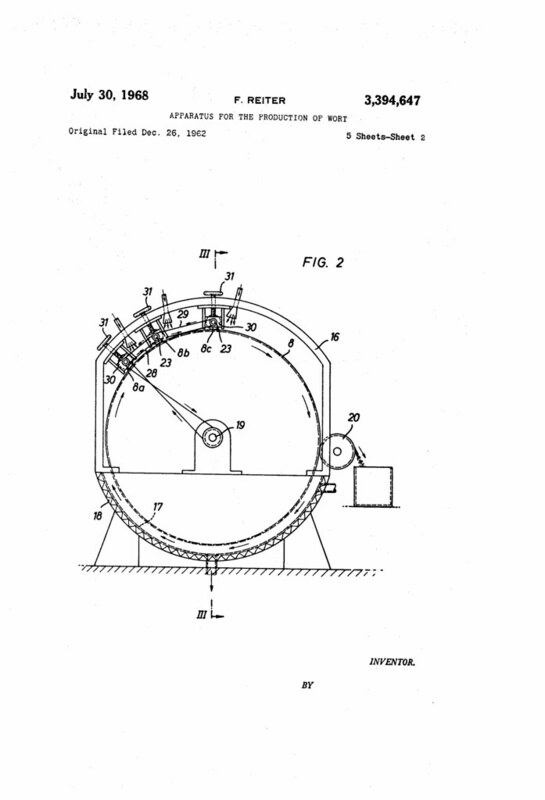 An apparatus for continuously making beer wort from dried malt has a malt soaking unit and a malt crusher which is adapted to receive the soaked malt from the unit and has at least two smooth-surface cooperating rolls and drive means for driving them at differential velocities. 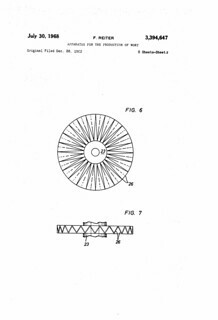 A conduit system has a plurality of upright heatable conduit sections and serves for heating a mash which is produced after the malt has been treated in the crusher, and a clarifying unit is provided for clarifying the mash having been heated previously. 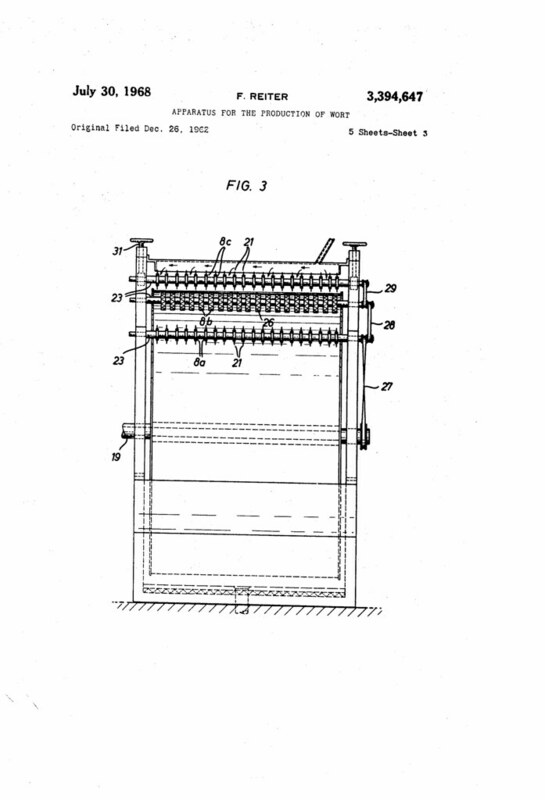 In an apparatus for the production of wort, a filter drum for the separation of the wort from the spent grains comprises suction means to draw the wort into the drum and means cutting the cake of spent grains accumulating on the periphery of the drum, while it is being sparged, into small readily extracted pieces. 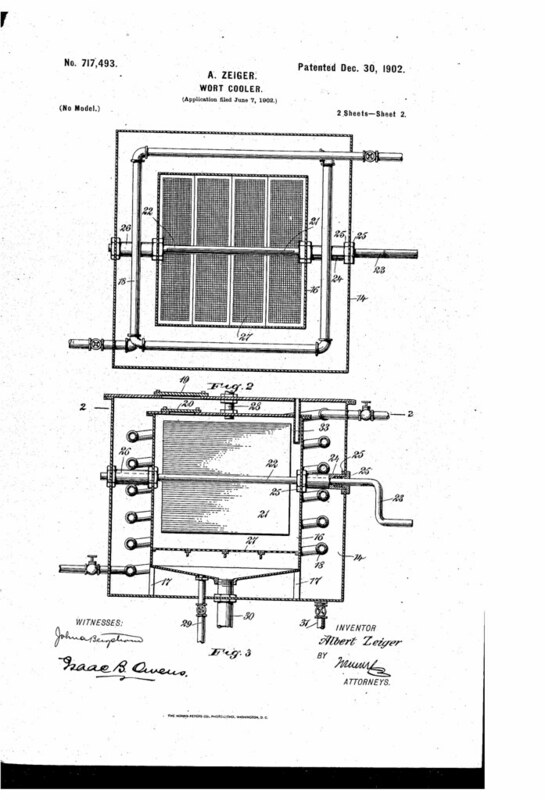 An apparatus and a method for stripping wort, with the apparatus including a receptacle that has a wort inlet and a wort outlet, and a heater on the side wall of the receptacle as well as a distributor device which applies the wort to the heating surface of the heater, such that the wort runs down the heating surface as a film. 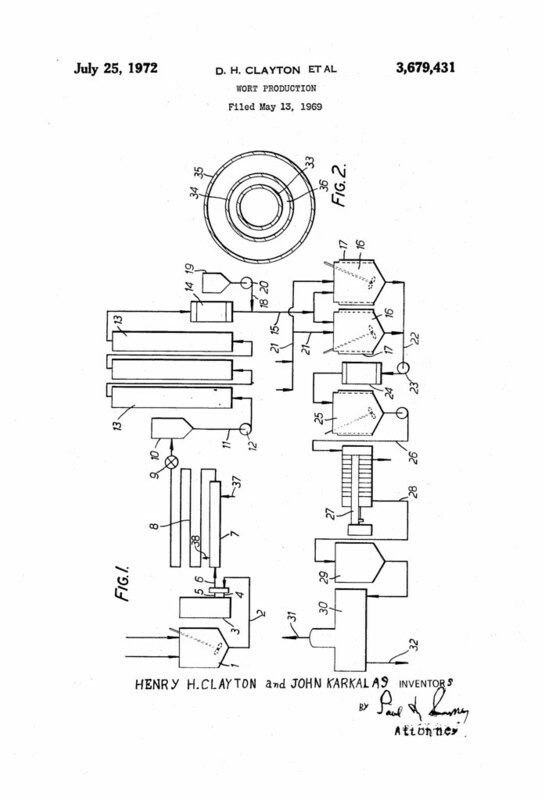 This invention relates to a process of brewing and more particularly to a process and apparatus for reconstituting concentrated brewers wort. Wort concentration has great potential and can offer advantages by increasing the production efficiency of existing plants, increasing production volume without a corresponding increase in capital expenditure and providing a simplification of both production processes and control of product uniformity without sacrificing quality of product. More specifically, concentrated wort provides several distinct advantages. Brewhouse equipment generally works at peak capacity for only a few months of the year. By concentrating wort during off season periods a more efficient use of the facility results so that the brewhouse equipment can be used more efficiently throughout the year. 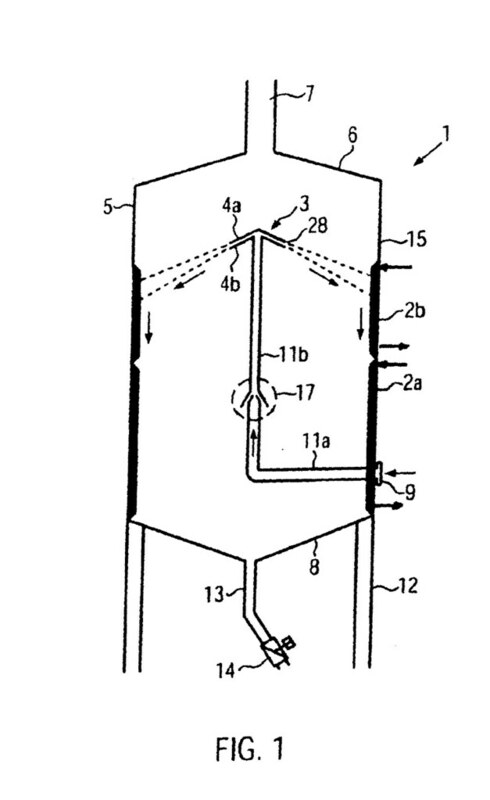 In addition, concentrated wort can be shipped to distant points where it can be reconstituted, fermented, finished in plants which can be built at relatively low cost because they do not require the expensive grain handling and brewhouse equipment. 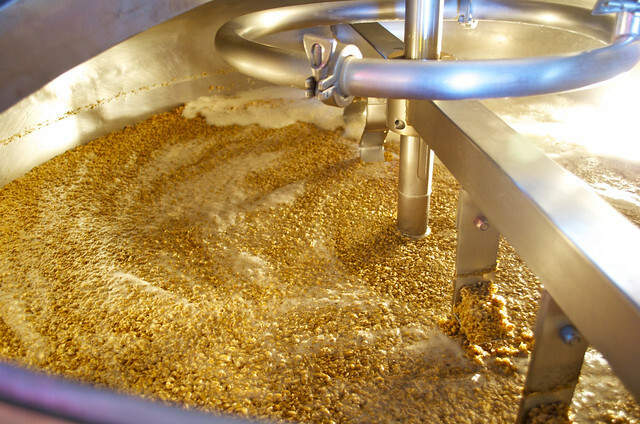 Moreover, weight savings can be realized by shipping the wort concentrate as opposed to shipping malt and raw grains required for conventional brewing. A system of wort concentration and reconstitution has outstanding potential in conjunction with a continuous or accumulated batch fermenting system. Wort concentrate is stable in storage and the concentrate can be metered into the present system in the desired flow rate, reconstituted, and then passed directly into the continuous fermenting system without storage. 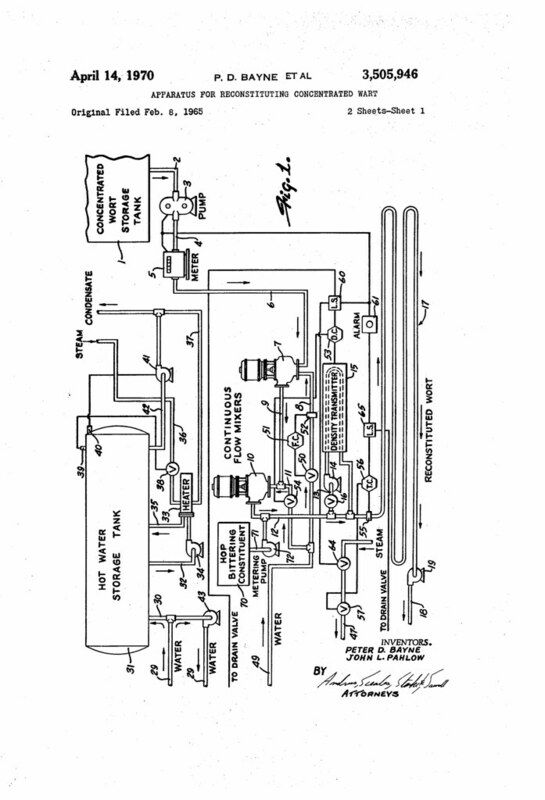 Using the reconstituting system of the invention in conjunction with a con tinuous fermentation process averts the necessity of holding the reconstituted wort at temperatures and under conditions which might create microbiological growth. 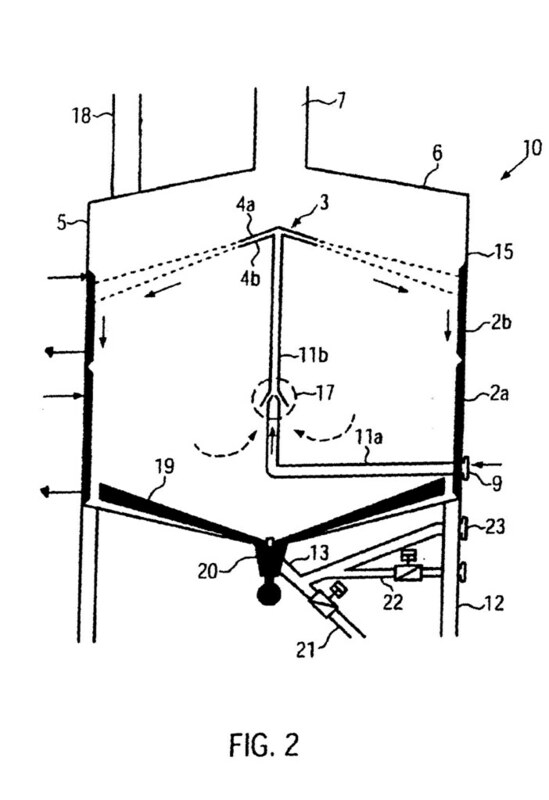 Moreover, combining the reconstituting system with a continuous fermentation system completely eliminates the necessity of large storage tanks and chillers for maintaining a supply of wort for fermentation and provides a substantial cost saving in plant and equipment design over that of conventional systems. The concept of wort concentration provides an alternate approach to the problems that some brewers have attempted to solve by freeze concentration of beer. Wort concentrate, because it does not contain alcohol, does not present the legal ramifications which accompany freeze concentrated beer. 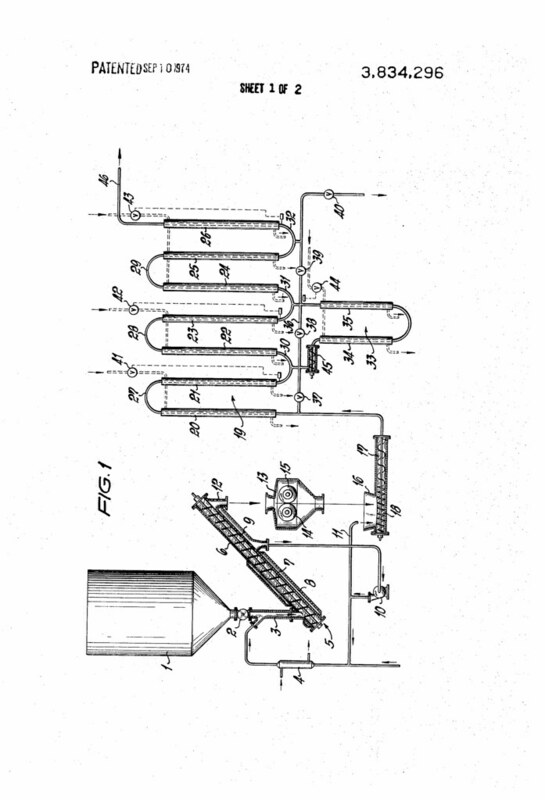 The present invention is directed to a continuous, high capacity process for reconstituting concentrated wort. The wort is reconstituted without color gain, loss of hop bitter or alteration of flavor. 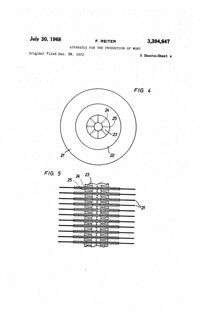 According to the invention, concentrated wort at a temperature of from 60 to F., but preferably under and having a solids content of 80% is continuously pumped from a storage tank and/or shipping containers and passed into a mixing system. 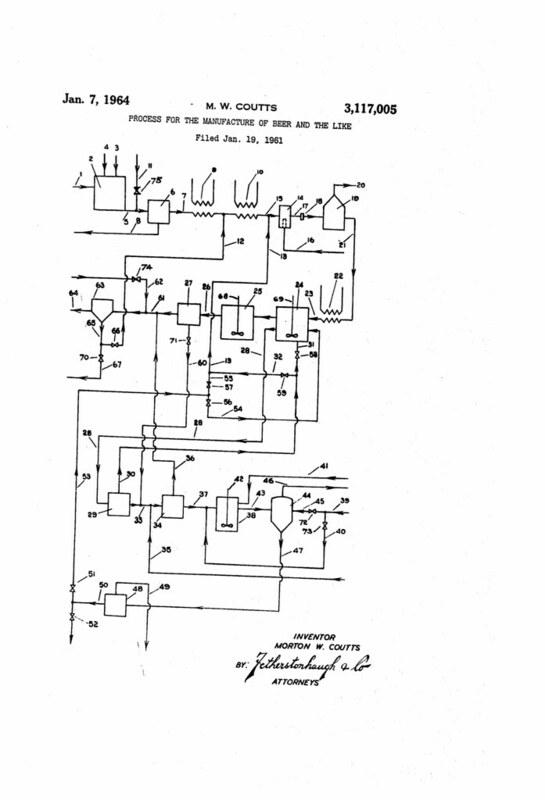 Deionized water, or filtered mains water, depending upon the purity of the water, is introduced into a mixer at a constant flow rate and is mixed with the stream of concentrated wort to partially reconstitute or dilute the wort. In some cases, particularly in high capacity installations, a second mixer in series may be employed and a second stream of either deionized water or filtered mains water is introduced into the second mixer down stream from the first mixer. 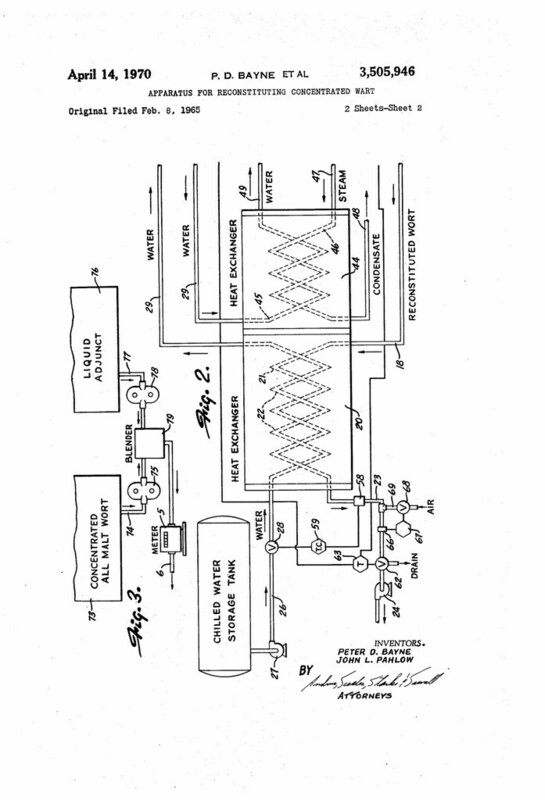 This second or breakdown stream of water is continuously introduced at a variable flow rate and mixed with the partially reconstituted wort to complete the reconstitution to the fermentation gravity. 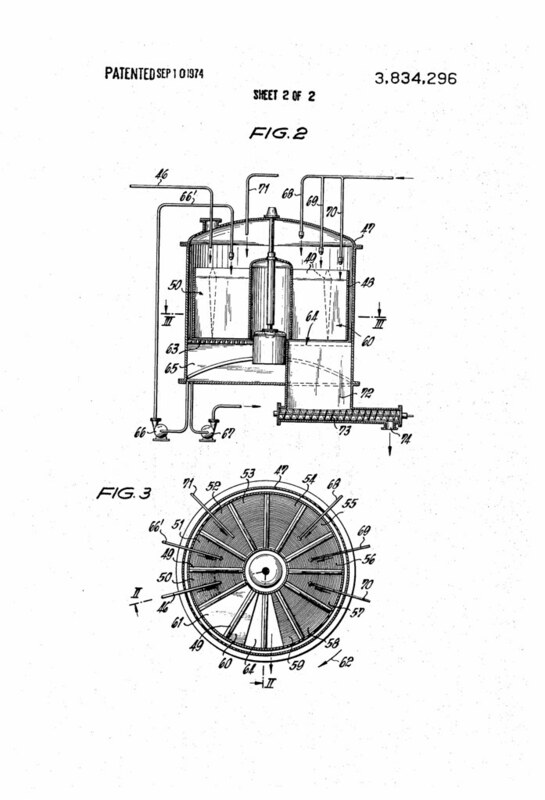 This invention relates to a process for the manufacture of beer and the like and has for its objects the provision of an improved continuous process for such manufacture which makes use of certain phenomena which occur during the preparation of brewers Wort and the fermentation thereof and which individually cause problems in production but which when combined bring about beneficial results. For example, when brewers wort is boiled certain heat sensitive material precipitates and coagulate-s. It has been found that these precipitated particles while in a boiling state have adsorptive properties and take up from the wort many objectionable and unwanted flavours. It is normal practice to hold the hot wort before cooling, and during this time these particles coagulate and as they coagulate gradually lose their adsorptive powers, the adsorbed flavours again becoming soluble and so producing objectionable flavours in the finished beer. 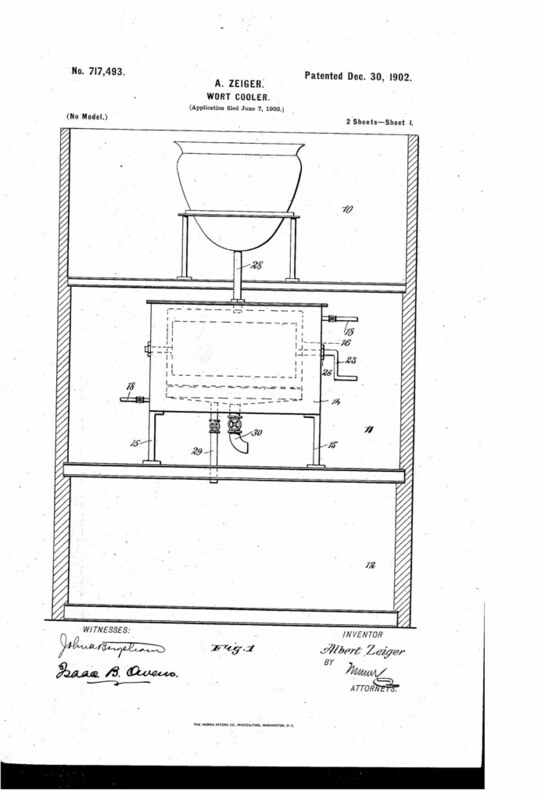 This invention relates to an apparatus for cooling wort as it comes from the kettles in the brewery; and it embodies certain novel features of construction and arrangement of parts which enables it to be used not only as a wort-cooler, but as a strainer to remove the hops from the wort, thus permitting the wort to be run directly from the cooler into the fermenting-room and dispensing with the necessity of the hopper-jack, which has heretofore been used. 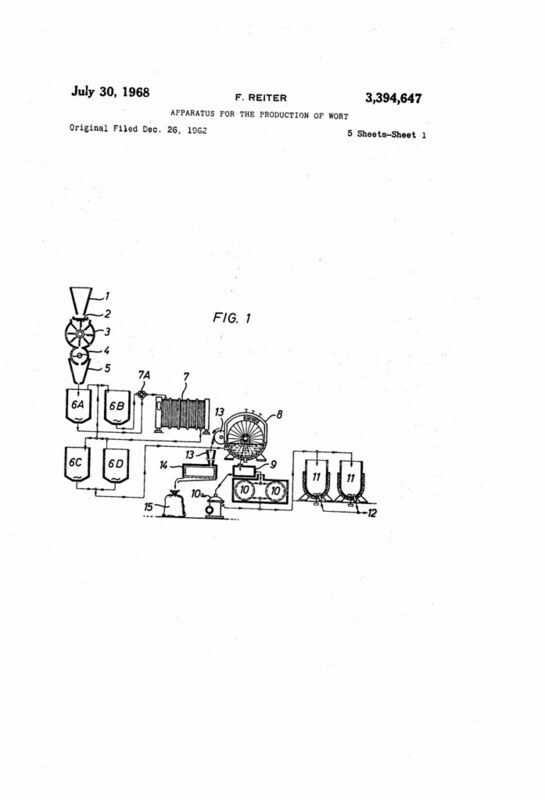 I have invented a-certain new and useful Improvement in Wort and Yeast Aerators for Beer Vats, of which the following is a full, clear, and exact description, reference being had to the accompanying drawings, forming part of this specification. This apparatus is constructed and arranged consists in features of novelty hereinafter fully described, and pointed out in the claims. 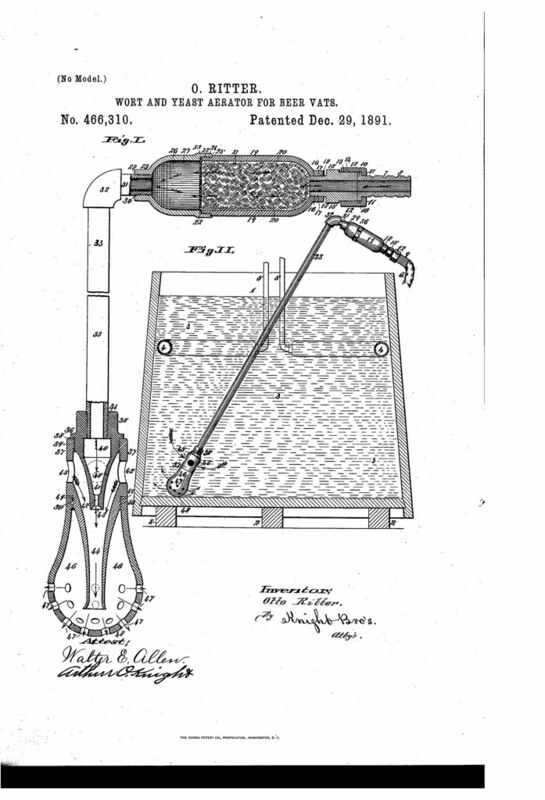 Figure I isa detail view of the aerator and shows the coupling for the air-hose, the air filter, the bulb-casing of which later forms a handle or hold for the operator, by which he directs the instrument. 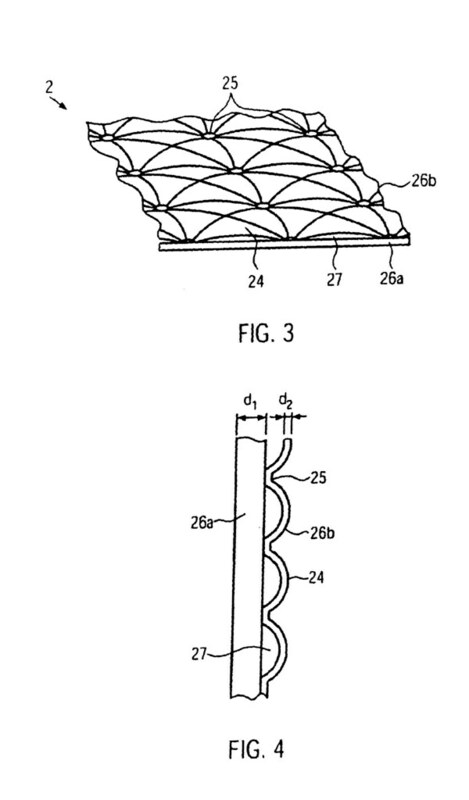 It also shows the inception filtered air-chamber, the supply air tube, and the compound aerating-bulb; and Fig. II is a vertical section of a brewers fermenting vat and shows the yeast and wort aerator in active operation therein.